An advanced, natural design tool for the mobile professional. As a product designer, I need a tool with the flexibility of a traditional sketchbook but with the speed and versatility of a digital drawing tool. Concepts allows me to iterate faster while remaining flexible and creative. Everything is designed. Our houses and hospitals, mobile phones and websites, our video games and jetpacks… all of our ideas start as Concepts that grow over time. 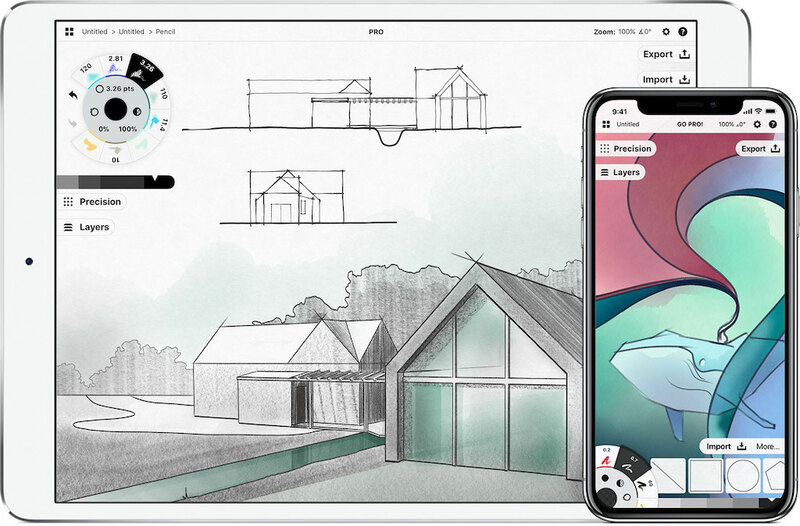 Concepts (the app) is an advanced version of sketching paper, where natural tools meet vector manipulation so ideas can change and grow as you do. Concepts is powered by our next-generation hybrid vector-raster Fluid Engine — 64-bit precision with multi-threaded rendering, an infinite canvas with sharp strokes at any zoom level, and mobile from the ground up. Optimized for high performance 120Hz displays and ultra-low latency styli like the Apple Pencil and Surface Pen, Concepts is more responsive than any other drawing experience. Just like paper, only better. Make rapid iterations or explore happy accidents — Concepts is flexible to the core. Pick up anything you’ve ever drawn with a tap+hold, and copy it, measure it, change the tool or line weight or colors, or just throw it away. It’s the beauty of traditional tools with the power of vectors. Having the ability to draw with real accuracy on the iPad using a tool like Concepts has fundamentally changed my workflow. Now both the initial sketches and the more polished products live side-by-side in the same documents, and I can go back and forth from freehand to highly technical drawings without even switching to a new document. It’s easy to get started with Concepts, no matter what your budget or needs. The free version of Concepts is a sketchbook on steroids. Use an infinite canvas, gorgeous brushes, 5 layers, and a whole lot of creative freedom. No account or signup required - just download the app and start sketching. For the casual creator to the true professional, upgrade your creativity with these powerful addons. Note that while we’re working towards a unified platform, there are some differences in feature availability. Make Custom Brushes, Manipulate Anything w/ Advanced Transforms, use Precision Tools and Shapes, Infinite Layers, Export to both vector and high-res formats like SVG, DXF or PSD*. Manipulate Anything, use Infinite Layers, and Export to 300dpi+ PNG. More coming soon. Speed up your process with our professional library of royalty-free brushes and objects. Quickly add style with our professional library of brushes. Custom drag-and-drop libraries make repetitive workflows fast and reliable. Import single or multi-page PDFs, and export vector or flattened versions. Move faster and accomplish more with the Everything option (including 47 libraries and services), and enjoy the benefits of steady updates every 4-6 weeks that will not only make your work more enjoyable, but mobile to boot. Learn more about our view on subscriptions. Share Object Packs and Color Palettes with your team or anyone else. Exclusive access to learning and support from pros like you. *Prices may differ based on your location. Purchases are completed inside the app. Available features may differ between platforms (as we continue to iterate). PSD export requires a free Adobe Creative Cloud account.